Joyetech ESPION Silk honest review. Hello, dear Social! Today I would like to tell you about Joyetech ESPION Silk with NotchCore atomizer. Silk belongs to the niche of starter kits with built-in battery, housing a pretty neat 2800mAh cell unit. The only real inconvenience brought by this design is the impossibility, if necessary, to replace the battery. 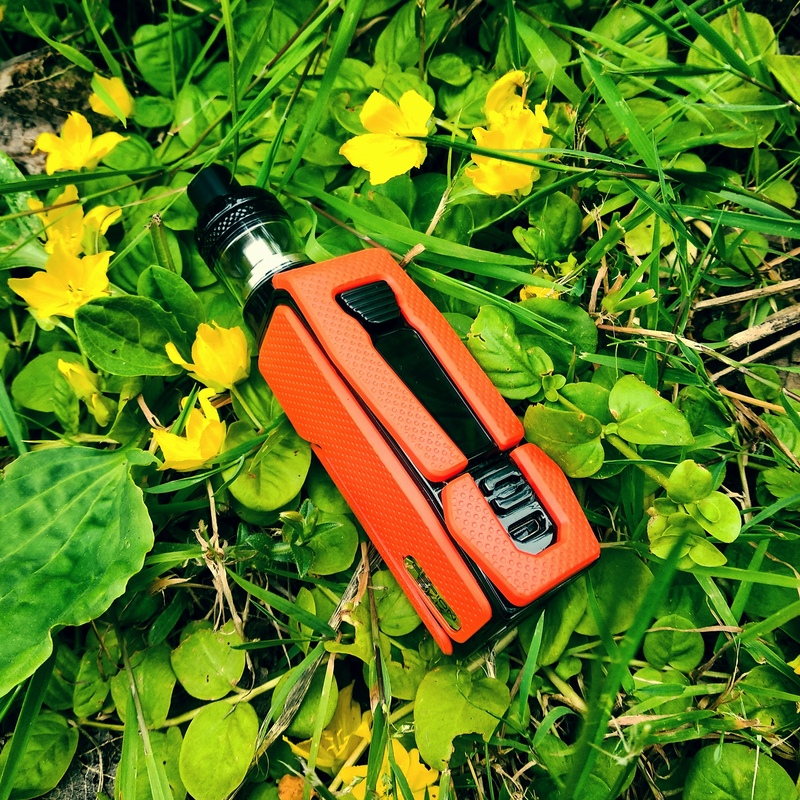 However, newbie is completed with an atomizer, which will not require too much power for operation and, as a kit, will provide enough vape breaks for a day or even more. A good bonus is the presence of fast charging by currents up to 2A, capable of returning ESPION to life in the shortest possible time. ESPION Silk is available in three colors: black and red, orange and beige. The inserts are made of very soft rubberized plastic, which has hypoallergenic properties. This fact has a very positive effect on the weight characteristics: the set with an atomizer weighs 141 grams, and the mod itself - only 100. The height of the set is 120 millimeters (without an atomizer - 80), the length is 40 and the width is 29.5. Silk - a very "touching" model, twirl it in your hands delivers a complete pleasure. Using an internal battery allowed to significantly reduce the size and weight of the device: so much that you might have constant checks if Silk has fallen out of your pocket. To scratch or damage the paint-job of Silk, for obvious reasons, is almost impossible, instead, bright plastic has the property of getting dirty. It can be wiped out in any way known to science. It should also be noted that the hull has no any shockproof or water-repellent properties, despite the expressive appearance. The heart of our silky friend is a familiar board that can work with a resistance of 0.05 Ohms in all modes, respond to the main button in 25 milliseconds and protects the user from various over-discharges, over-charges and short circuits. The lack of a real-time clock is a pity, but all other modes, including Bypass and TCR, remained in place. Oh yes, the buttons turned out to be really cool: they have a distinct click when pressed, plus and minus are blocked by simultaneous hold, and the fire button is pleasantly rough. The ventilation holes and everything necessary to reset the device are located on the bottom edge of the device. The role of the kit atomizer is played by NotchCore - the "younger" brother of the partially rebuildable RIFTCORE DUO. NotchCore does not have any tricky heating plates made using alien technology - it uses the well-known NotchCoil, but with a resistance of 0.45 Ohm. There are five pieces of such "spirals" in a kit, not counting the already installed one. Cotton can be replaced, but it needs to be done with caution: the nature of NotchCoil is very fragile and breaks easily, it settles slightly from heating, and things will not work out in the manner of ordinary spirals: you can't fix it once you have damaged it. The pros - the spiral is installed horizontally, which has a positive effect on the taste, while it provides a good evaporation area and eliminates the possibility of short circuits. In due time NotchCoil worked perfectly in thermal control (because it's made of stainless steel), I will not exclude the possibility of a special mode in the future firmware upgrades developed for this heating element. Now it is necessary to use this type of heating elements in the power range from 20 to 30 watts. The volume of the NotchCore tank is 2.5 milliliters, the diameter is 22 millimeters. A nice detail - an arrow indicating the direction of the sliding cover, is now painted and it's not necessary to spend ages trying to figure it out. Conclusion... It's somewhat hard for me to make a conclusion. I have some complaints about the atomizer: as for me, it does not have enough airflow options. At the required power, it can be a fairly good option for a soft and rather tight inhale. It can be easily upgraded by making three small holes and put a rubber band under the ring, EXCEED-style. NotchCore ain't that bad, it's really good, but it can be made better. Silk itself can bring some nice emotions with the first touch, and after it – you will either fall in love, or not. 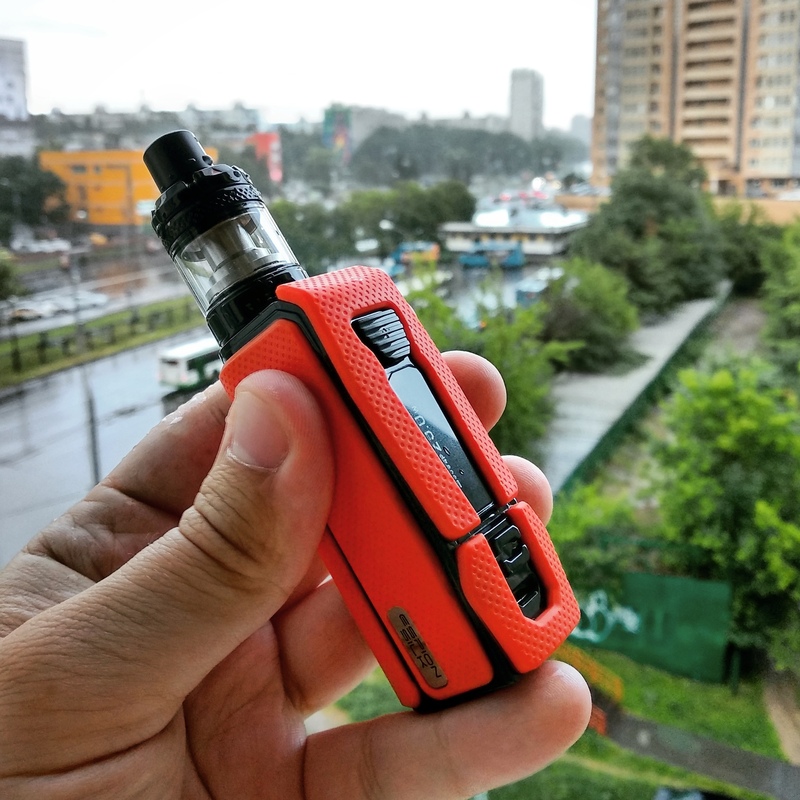 This beautiful and compact kit can be a nice gift to your girlfriend and for the people who had some concerns about vape gear being too heavy. Overall quality of the device is very high. Thank you very much for your attention, I wish you a wonderful mood! Great, fabulous photos! 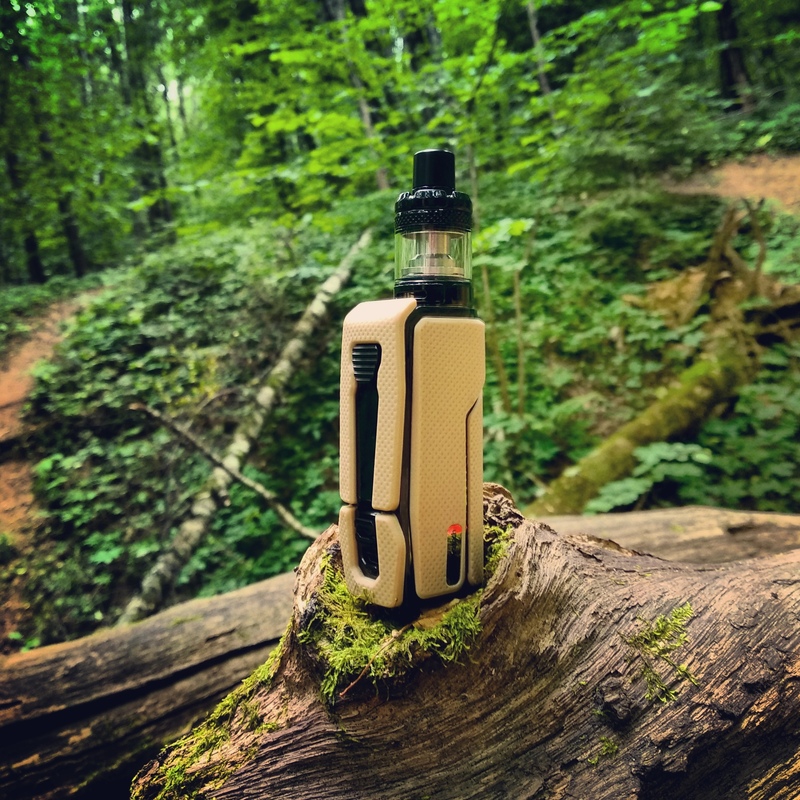 I must not be lazy, take more vape photos outdoors! I had no problem re-wicking the NotchCoil, a slight stretch is recommended before inserting into the deck. I didn't feel the need to dry burn the bare coil, which I felt may degrade the material, a gentle scrub with a toothbrush cleaned it up fine. You're on the nail regarding the "love it or hate it" point, I love it, but as you say MTL may not be feasible. (07-04-2018, 02:18 PM)Ippolit Wrote: Great, fabulous photos! I must not be lazy, take more vape photos outdoors! Well, let me describe how I tried to change the coil. I didn't want to touch the coil or cotton with bare hands, sp I thought that using the tweezers will be a good idea, so I broke the first coil with them, lol. After that I tried to install one with my hands and broke it by applying too much pressure. I'm really afraid that doing that with bare hands can affect the taste and things. I have burned one coil to see what happens, it's okay if done on the low wattage, but will stretch the coil for a bit. I love the feel of the mod, it's sooooo soft and touchy. Atomizer is not bad, it just can be better. Good review, great photos. I had difficulty rewicking also, if I did not stretch the coil slightly the rewicked tank would leak, and not over stretching the coil was difficult. I think replacement coils will be cheap and the best way for me to go. I get about 1/2 the lifespan of a ProC coil, so if these coils sell for 1/2 the price of ProC that will be good. Yes indeed. I have since found that a lot more cotton is needed than you think is required at first glance, if there's not enough cotton liquid will flow through the wick and the coil down into the air channel and out. You shouldn't over trim the ends either, which is a bit counter intuitive as I discovered. But as you say they are cheap enough!